WHAT IS KAMBO? THE ORIGINS OF KAMBO HOW IS KAMBO HARVESTED? WHAT IS KAMBO USED FOR? HOW IS KAMBO TAKEN? "Fantastic chemical cocktail with potential medical applications unequaled by any other amphibian"
Kambo is the secretion of the Phyllomedusa Bicolor, or more commonly known as the Giant Green Monkey Tree Frog, found in many regions throughout the Upper Amazonian rainforests. Given that this frog has no natural predators and is a prolific breeder with a single spawn of one female averaging 1,000 eggs, they are found in abundance, and the ICUN database lists them in the 'Least Concern’ category. The potential destruction of their habitat and spawn predation are the only known threats. The secretion of Kambo is a highly unique and complex treasure trove of peptides, neuropeptides and bioactive peptides, which are all short chains of amino acids, the building blocks of all human life. In the 1986 Vittorio Erspamer, an Italian scientist of the University of Rome, was the first to analyze Kambo in a lab setting. 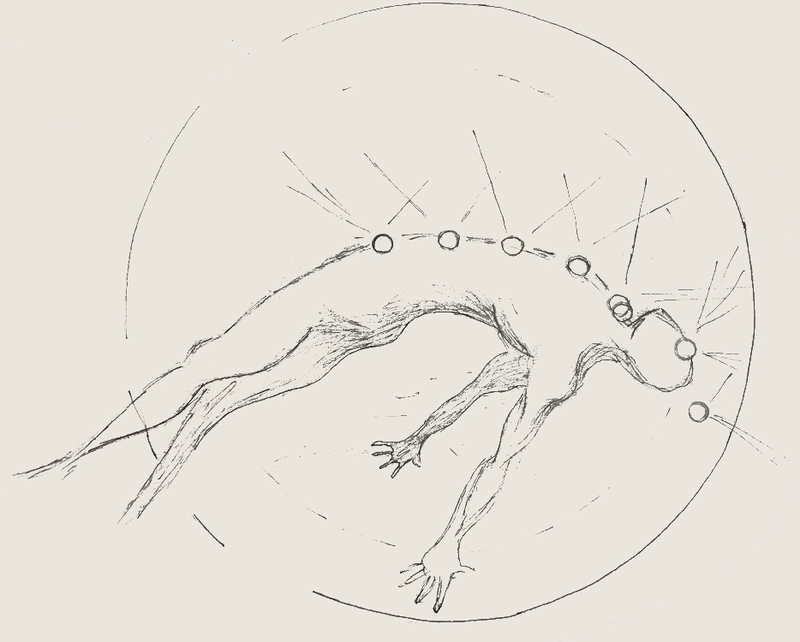 He concluded that Kambo contains a 'fantastic chemical cocktail with potential medical applications unequaled by any other amphibian.' Espamer's sixty year career included two Nobel prize nominations and innumerable important contributions, including the isolation and discovery of numerous different compounds, many of them from animals, with the majority from amphibians. His lab work focused on peptides specific to the Phyllomedusa Bicolor brought some understanding to the positive impact Kambo has on the human body. He highlighted its ability, unlike most other natural substances and pharmaceuticals, to pass through the blood brain barrier, as well as its capacity to also act like a key to unlock individual cell receptor sites that allow the entry of this 'fantastic chemical cocktail,' enabling its healthful properties to deeply cleanse and detox the human body. To date researchers have identified nine families of peptides in Kambo. These nine families of peptides include bioactive peptides, neuropeptides, heptapeptides and polypeptides. Each of these have different effects in the human body, some of which include: potent analgesic properties, long lasting reduction in blood pressure, high potency against the yeast Candid Albicans, potent antimicrobial activity against drug-resistant strains of bacteria, yeast, fungi, parasites and enveloped viruses as well as various filamentous fungi that are responsible for severe opportunistic infections accompanying AIDS. Additionally, there are effective components for killing certain types of cancer cells, anti-inflammatory properties, and potent vessel dilation making the blood brain barrier more permeable. This in no way is an exhaustive list, rather a general idea of the amazing potential that exists in Kambo. Interestingly due to the medicinal values discovered in the above mentioned peptides, many have been synthesized and are now available for sale online. Additionally, over 70 Kambo patents have been logged, mostly in the United States. More scientific information can be found here. Many researchers believe that the different components found in Kambo may open doors for the treatment of Chronic Fatigue Syndrome, chronic pain, cancer, HIV, Parkinson's Disease, Alzheimer's, depression, vascular problems, hepatitis, diabetes, rheumatism, addictions, high blood pressure, fertility issues, PTSD, anxiety and much more. This ongoing research is also providing opportunities for the development of new and more efficient Nano technological based therapies for treating infectious diseases. Kambo has been used by several tribes for thousands of years, and many stories and legends exist as to how each tribe came to use this medicine. The most widespread story comes from the Kaxinawá tribe of Brazil. It is told that the tribe had fallen very ill. The medicine man (Pajé in Portuguese), after unsuccessfully trying all the medicinal plants to help his people, in desperation he entered the forest under the influence of a sacred plant medicine where he was visited by a female spirit bearing a frog in her hands. She showed him how to carefully remove the white substance from its back and taught him how to apply it. When he returned to his people, he did as she had instructed him, and his tribe regained their health. From that time forward he was known as Pajé Kampu or Kampum. Upon his death he lived on in the frog to maintain the health of those that protected the forest. This is how the secretion became known as Kambo, although other tribes refer to it as Sapo, Dow-Kiet, Kampu, or Vacina da Floresta. In 1925, Father Constantin Tastevin, a French priest, was the first outsider to observe Kambo while staying with the Kaxinawá of Brazil. In the 1980's Katherine Milton, an American anthropologist gave accounts regarding the use of Kambo while with the Mayoruna, a tribe also from Brazil. Peter Gorman, the first person to gain access to the medicinal knowledge of the Matses of Peru, began to write about his experiences in the 1980's. The rubber tappers in Brazil came to know about Kambo from the Amazonian Indians in the 1990's and took it out into the towns of Acre and began applying it themselves. Francisco Gomes from Cruzeiro do Sol, who lived with the Katukina for many years and is one of the first to initiate the use of Kambo outside of the Amazon. Before long, others began to give Kambo to people in the larger cities of Brazil. As of 2004, the Agência Nacional de Vigilância Sanitária (ANVISA) in Brazil prohibits any advertising that makes claims of any medicinal or therapeutic benefits of Kambo. This was the response of the Brazilian government to the representation made by the Katukine people with regard to intellectual property rights. Other than this restriction, Kambo is legal everywhere in the world. The frogs can be found in the trees near the rainforest waterways known as Igarapés, where they gather to sing and announce the rain. The Indians go out at dawn and sing and imitate the frogs' song to locate them in the trees. The frogs are very docile and nonreactive when they are picked up, possibly because they have no predators. The frogs are then gently tied by each leg with Palha strips, similar to straw, into an X shape; some of the secretion is carefully scraped off and put on small pieces of bamboo to dry. After its release, the frog returns to its habitat unharmed. The Palha strips leave white rings around the frog’s legs that takes about 3 months to fade, which lets the Indians know not to harvest from any frog that still has the white ring on its legs. The Indians believe that harming the frog will anger the animal spirits bringing negative consequences, and so they use the utmost care and respect when handling the frogs. Kambo collected in this way is considered 100% ethically harvested. We use only the freshest Kambo from Peru that is harvested in this manner. Kambo is a great tool to help release emotional blockages, giving assistance to overcome obstacles, negative thinking and long standing habits. Traditionally, Kambo is used by many indigenous tribes in a myriad of different ways. The primary use centers around lifting Panema, which is an indigenous name for negative or dark energy and for its “Hunting Magic.” The native Indians believe that Kambo gives them strength, heightens their senses, speed and endurance as well as making them “invisible” by temporarily eliminating their human scent. It is also used medically to treat malaria, snake bites, fevers, infections, fertility problems; to cleanse, detox and give strength to the mind and body; to reduce pain and to increase stamina and energy. Today, as Kambo is gaining recognition around the world for its naturally strong detoxing properties to help clear out physical, mental, emotional and spiritual issues, people are seeking it out for detox, to strengthen their immune systems, and for increased energy and focus. On the spiritual and energetic side, Kambo is a great tool to help release emotional blockages, giving assistance to overcome obstacles, negative thinking and long standing habits. This helps to illuminate one's path and to more naturally experience ease and a deeper sense of authentic fulfillment. Most people who take Kambo report that they do have more energy, get sick less often, have less pain, deal with stress more effectively, feel more focused, have more clarity, experience an overall sense of well-being and emotional stability, as well as having inspiration to pursue the things in life that bring them more satisfaction and fulfillment. Also worthy of noting is that many skilled practitioners' passion and commitment to Kambo have found very effective adaptations for more targeted applications of Kambo. These include placing the secretion on specific meridians of traditional Chinese Medicine (TCM), on the chakras (energy centers in the body) and in the ears, which is known as Auricular treatment, adapted from French Auriculotherapy. Small holes called gates are burned on the surface of the skin, about 1/8” across or less. The top thin layer of skin is gently rubbed off exposing the epidermis below - there is no blood. The number and placement of the gates differ for each person depending on the individual. The dried Kambo is mixed with a small amount of water and divided into small dots that are then placed on the gates. The Kambo directly enters the lymphatic system so the effects are felt very quickly. Although the effects of the Kambo are immediate, intense and strong, the unpleasantness is usually over within 15 to 30 minutes. Within a few moments, most people will experience a warm to hot flush in the upper body and face accompanied by an increased heart rate. At this point, people react in different ways. Some may feel dizzy or spaced out, while some will have swollen lips or face and feel a slight tingling on their skin. It can feel as if the Kambo is racing around in the body, scanning for issues and then going directly to a specific place to begin working on that area. It is possible to feel a discomfort, throbbing or burning sensation in a particular are for a short time. Kambo is not psychoactive so it does not produce hallucinations, however, reality can seem altered for a short time. Some people will receive insights and direction for living in healthier ways. Most people will feel nausea and eventually will purge the toxins out. All types of purging may occur as Kambo works on physical, mental, emotional and energetic levels. At this point some will feel tired and will want to rest. Usually within an hour or so, people feel much better.